Capital efficiency is a critical determinant of how companies perform. Return on capital employed, which measures the surplus available to the providers of capital to the business, is a useful summary measure of this. Managements are judged by shareholders to have failed in strategy and execution when this measure declines. There are three broad sets of factors that combine to determine capital efficiency. One, the “portfolio effect”, which reflects past decisions by the company to invest capital in businesses that are now not very profitable. Two, the “business cycle” effect, which captures macroeconomic factors, or at least those that are external to the company. Three, “the management effect”, which is the outcome of managerial competence, or lack of it, which determines how effectively the company is taking advantage of the opportunities it has. It is useful to take this concept to the aggregate, economy-wide level as well. We know that economic growth is impacted by the amount an economy invests – that is, how much it adds to its stock of capital. But growth is also influenced by how productively capital is used at the aggregate level. And the outcome is essentially the consequence of the same three sets of factors. Are investments being made in the “right” sectors? Are macroeconomic or sectoral factors allowing capacity to be fully utilised? And are economic managers at all levels acting in ways that lead to capital being used efficiently? But there is a critical difference between the parameter at company level and the macroeconomic level. Albeit with some limitations, accounting standards measure capital productivity with reasonable consistency both across companies and over time. This allows shareholders to determine which of the three factors may be playing the most important role in the performance of their company. On the other hand, measuring capital at an aggregate level across the economy is extremely difficult; the outcome is highly sensitive to several assumptions. A more tractable macroeconomic measure, notwithstanding its limitations, is the incremental capital-output ratio, or ICOR, which is the ratio of how much the economy invests each year (measured by the investment-GDP ratio) to the GDP growth rate that year. The higher the ICOR, the less efficiently capital is being used by the economy. Apart from the obvious drawback that it does not measure the existing capital stock in the economy, it also does not capture the fact that investment in any year may impact the growth rate not so much in the present as in the future. But these are analytical refinements that may sharpen the picture. A simple story can be told on the basis of the most simple computation of the ICOR. The graph presents the ICOR over the past 20 years. There are episodes of relative stability, punctuated by sharp spikes. The average for the 20-year period is 4.1, which basically means that if the economy is investing, say, 30 per cent of GDP in a year, the growth rate could be expected to be, give or take, 7.3 per cent. In fact, during the pre-crisis high-growth phase, 2003-08, the average ICOR was 3.4. Evidently, while high capacity utilisation can explain the relatively low ICOR during this phase, the fact that it is significantly below average also suggests that there were other factors working to enhance capital efficiency. Let’s look at the episodes during which ICOR spiked. During the three-year period 2000-03, it averaged 5.4. In this period, the average growth rate was about 4.5 per cent, so there was a definite business cycle effect at work, but when we take into account that the investment-GDP ratio was about 24 per cent, it does not appear that the other factors were particularly significant. The relatively low growth rate can be explained in terms of the relatively low investment rate. We appear to be in another phase of rising ICOR. 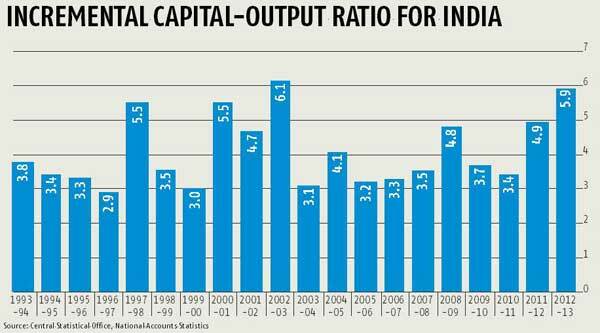 With growth slowing from 9.3 per cent in 2010-11 to 6.2 per cent in 2011-12, the ICOR rose from 3.4 to 4.9. With a further slowdown in growth to five per cent in 2012-13, the ICOR further rose to 5.9, just a shade below its highest value during this period, 6.1 in 2002-03 (though the three-year average was 5.4). So the business cycle effect is clearly at work. However, while the investment-GDP ratio in 2002-03 was 23.8 per cent, it was 30.6 per cent in 2011-12 and 29.6 per cent in 2012-13. Evidently, the economy invested substantially more during the most recent slow-growth phase than it had in the previous one, with not much more to show by way of growth. We need to think about the role that the other two factors – portfolio and management – are playing in the current episode of declining capital efficiency. Two examples come immediately to mind. First, during the high capital efficiency phase 2003-08, the network externalities from a significant expansion in telecom capacity and the highway system raised the productivity of virtually all other assets. This is the catalytic role of infrastructure investment that we are sorely missing today. The productivity benefits of telecom have plateaued out, following the familiar S-curve pattern. The highway programme lost momentum for a variety of reasons over the past few years, but more than the highway network itself, I believe that it is the laggard and, in many instances, non-existent development of access and service roads that is negating the overall productivity impact of the investment. The second, an issue often raised in my previous columns, is a clear illustration of the portfolio effect. Massive investments in thermal power generation capacity have not been matched by commensurate investments in coal mining. Building up large capacities that are forced to remain idle because matching capacities have not been put in place is a magic formula to force the ICOR higher. Why these matching capacities were not put in place is a question relating to the management effect. The bottom line is that the investment-GDP ratio is still far higher than the current growth rate might suggest. Returning to a high-growth path will depend significantly on improving capital productivity or lowering the ICOR. Both portfolio and management factors need to be addressed. This column first appeared in the Business Standard, on March 23, 2014. The views are of the author(s).